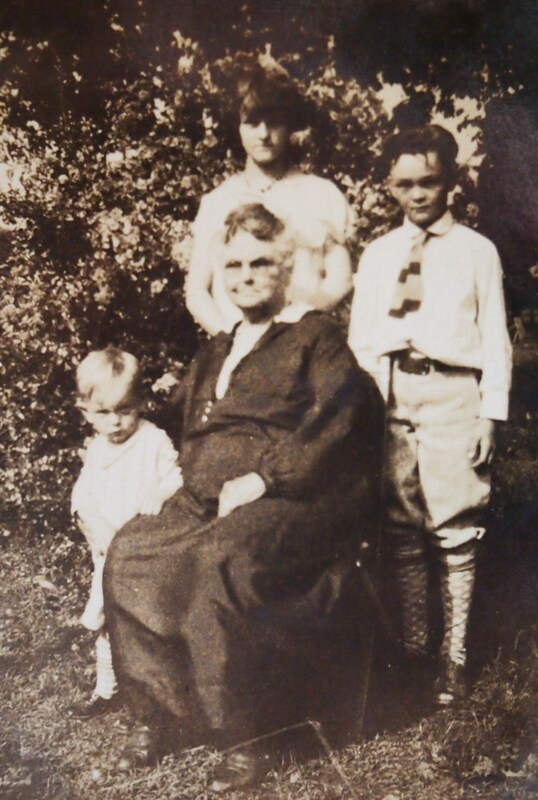 Lester (upper right) with his sister Frances, little brother Wallace, and their grandmother. Since I never got the other letter mailed yet I will write a little more this afternoon while I am not busy. August is gone again this afternoon and we are going to have a birthday party afterwhile so I guess there won’t be much work done this afternoon. I did work all forenoon though. I believe I am beginning to get on to the work a little now but at first I thought I never would learn. It still makes me nervous when I have to make out a loan in a hurry. They say that after harvest the men come in and we sometimes have to make as many as twenty loans a day. There is so much to it. The worksheets have to be made out, then the loan, then the folder must be labeled and put in the file. A record is kept of every loan that is made and all the feed wheat that is sold. It started to rain last evening and we had a little shower but it didn’t make things very muddy for which we are glad. The weather is going to get a little cooler I believe but that will be all right too for it has been so warm it has taken all the pep out of me. Mae and Bill are in town today. Bill is home for a week. They are trying to sell the farm and he thought he would come home and see about it rather than sign things down there. They were going out to Delavan this afternoon to see about getting on out there. But he said if it wasn’t quite a lot better than his present job he wouldn’t change. He is making pretty good now. They wanted all of us to come down Sunday so he could see everyone but Gloyd has to work so I know we can’t go until after dinner anyway. If it is nice we might drive down in the afternoon. Since we are rationed on gas we won’t be able to go much. They are creating new boards here all the time and some of them meet up here. They have a new gas rationing board and one to check the tires. I guess they call it a transportation board. They are in need of a new secretary for the board but so far they haven’t been able to find one. Dolly Collins worked one day and decided it was too much work. The state man was here Wednesday and told Helen that any one that wasn’t worth $2.50 a day wasn’t worth having. We decided we might as well go home for we are only getting $2.25. We hope for a raise before too long though. Gloyd got his notice to take his screen test Tuesday. Of course they aren’t really reclassified until they take that but there isn’t any doubt but what he will be all right for there has to be something decidedly wrong with anyone now before they are turned down. He thinks maybe he would like to get into the ground crew of the air force. I would rather have him there than in a lot of places. I was in hopes he wouldn’t have to go before Christmas anyway and maybe he won’t if Kirk can get him deferred. Wayne took the test to get into the radio school for the signal corps or something of the sort and heard that he had passed but hasn’t been told to report yet and has already received notice to go to Leavenworth for his physical the 27 of this month. He is very much in hopes he will be accepted in the school before he is inducted otherwise if he gets in after he draws army pay. He may join ghe ground crew of the air force if nothing else develops. Melchert has received his call to report the 26 of this month. That will just about leave Council Grove without any doctors. I guess Miller and Kerr will be here as long as Council Grove is. We went to the show Tuesday night and saw “This Gun for Hire.” We neither one cared for it as it was very much a gangster picture. I don’t know whether the money was given away or not. We never got it. Wednesday night we went on a weiner roast with the bunch. The rest of them went to the show afterwards but as we had already seen it we didn’t want to go again. They planned the party Monday night but I wasn’t there so didn’t know about it and they forgot to call us until noon Wednesday. Gloyd always has a meeting on Wednesday night anyway. They signed up another recruit last time but they still don’t have the company up to full strength. Mother called Wednesday evening. They are all well. They had been to Emporia on Saturday and she had gotten some things for me that I couldn’t get up here. I have been needing a little washboard and there just weren’t any here. I thought it would help a lot to have one that could be put in the sink. Then I have a sunshine sister that has a birthday the 21st of this month so I had her get a serving tray for her. The town has been full of soldiers the last few days. They are out on maneuvers from Fort Riley. Yesterday there were jeeps and tanks but every day nearly there are jeeps. They are quite a contraption. Gloyd thinks they would make a good mud car for mail carriers. The tanks were all named. One of them was named Eisenhower, Wainright, Vinegar Joe, and I can’t remember the names of the others. Well, I guess I have told all I know again this time so better get started on another letter. I think I will write to Paul. Seems like Gloyd doesn’t have much time and in the evening he is so tired he doesn’t feel like writing. The Folks. 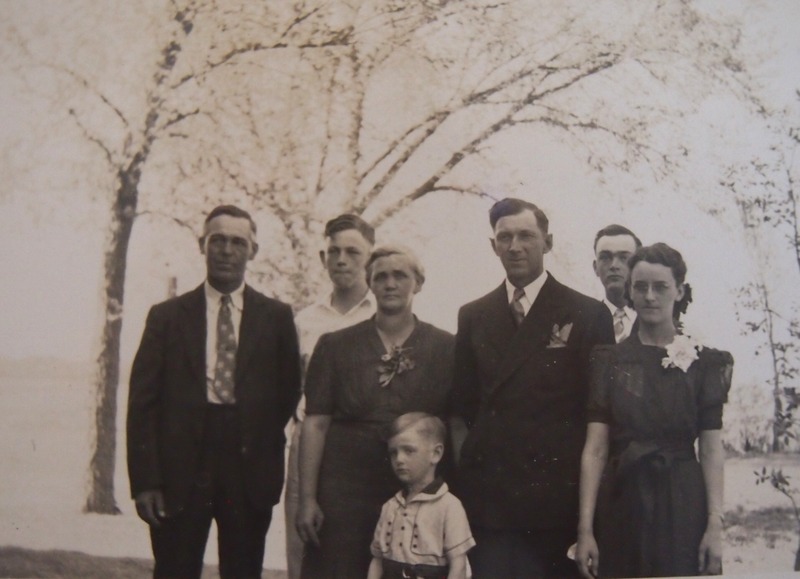 Paul in front; Charley, Georgia, Gloyd and Frances; Wallace and Lester in back.